Public Education: no longer "free"
Focus on the far left and the far right. On the far left we have the Woodside School District, serving a small population of children in an area with very expensive houses. On the far right we see our very own Redwood City School District, serving a very large population of kids in an area that's mixed, containing some expensive houses but mostly middle class ones. The result? Due to the intricacies of school funding, our district receives the minimum funding guarantee from the State while the Woodside district exceeds that lower bound with its own property taxes and receives a much larger chunk (the blue section of the bars). In addition to that, the Woodside district raises much more money per child, a result of having fewer children and a more affluent parent community. The red section of the bar shows a combination of donations and parcel tax income. So, what can we do? Ideally all districts in the State would enjoy similar levels of adequate funding, more like Woodside than Redwood City. Two options: try to raise the blue bar or the red bar. Raising the blue bar is virtually impossible without substantial reform in Sacramento, where the 2/3 Super Majority requirements result in a tyranny of the minority as described eloquently by James Madison in the Federalist Papers #22. A minority of Republicans is enough to block tax increases or any kind of meaningful reform. Attempts to change the 2/3 requirement, at least for passing local Parcel Tax initiatives have repeatedly failed. Sadly, we cannot wait for the State to act responsibly in defense of public education. The next option is to try to raise the red portion of the bar. The good news is that we, local residents, fully control that bar. We can finally pass a parcel tax, but that's going to take a while and is no sure thing based on previous experience. What we can do right now which can make a real impact is realize that the days of public schools fully funded by our taxes is over. We need to start thinking of a constant stream of donations to our public schools. Low income families don't have any choice: they are stuck with the public schools. If the public schools deteriorate, so will the chances of success of their kids. Upwards mobility, a key component of the American Dream, is no longer what it used to be. A monthly $100 donation to your school's PTA. A monthly $100 donation to the Redwood City Education Foundation. Your total "expense" for a full year of public education is $2000 (if you only contribute during the 10 months of school), a mere 1/10th of what you would pay to abandon the ideal of public education for all and move to a secular private school. And considering that our schools do wonders with the resources they have, this is an amazing bargain. Donating to your PTA alone is not enough. The RCEF is the only organization that fund raises for all the schools in the district (the red section of the bar in the graph!). Since it speaks for all the children, it can attract larger donors and fund larger items than you can do alone within your school. RCEF pays for much of our music instruction, the Outdoor Ed program, and much, much more. And if you don't have kids in the schools, and you voted for the Parcel Tax, please send a donation to the RCEF now, in lieu of that parcel tax payment you're not making. It's hard to accept that public education is not "free", but we can't ignore reality. We can't expect magical solutions from the State and we can't sit idly by while the schools receive less and less funding and cut more and more programs. 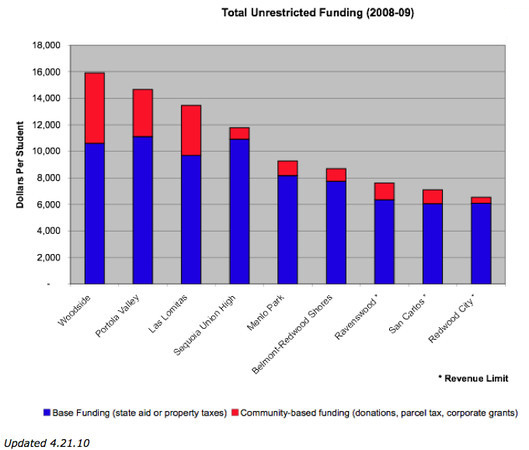 For a great overview of where we stand, check out this Redwood City Patch article: Redwood City Still the Only District Without Additional Parcel Tax Funding. To give a minority a negative upon the majority (which is always the case where more than a majority is requisite to a decision), is, in its tendency, to subject the sense of the greater number to that of the lesser... This is one of those refinements which, in practice, has an effect the reverse of what is expected from it in theory. The necessity of unanimity in public bodies, or of something approaching towards it, has been founded upon a supposition that it would contribute to security. But its real operation is to embarrass the administration [of government], to destroy the energy of the government... In those emergencies of a nation, in which the goodness or badness, the weakness or strength of its government, is of the greatest importance, there is commonly a necessity for action. The public business must, in some way or other, go forward. If a pertinacious minority can control the opinion of a majority, respecting the best mode of conducting it, the majority, in order that something may be done, must conform to the views of the minority; and thus the sense of the smaller number will overrule that of the greater, and give a tone to the national proceedings. Hence, tedious delays; continual negotiation and intrigue; contemptible compromises of the public good. And yet, in such a system, it is even happy when such compromises can take place: for upon some occasions things will not admit of accommodation; and then the measures of government must be injuriously suspended, or fatally defeated. It is often, by the impracticability of obtaining the concurrence of the necessary number of votes, kept in a state of inaction. He must have been watching the California budget squabbles with his time machine. Prop 13, which imposed a 2/3 super majority requirement for passing local Parcel Taxes and much more, has resulted in exactly this paralysis. 2007-­08: educated about 8,000 students with about $81 million; 2010-­11: educating over 9,000 students with about $81 million. K-­3 class sizes went from 20 students/1 teacher in 2008-­09 to 30 students/1 teacher in 2010-­11. Libraries open fewer hours per day and fewer days per week. Classrooms cleaned 1/week vs. every other day in 2007-­08. Services reduced, turnaround longer due to loss of 15 administrative and support positions in district office over the past two years. Appendix 3: The Gap has Widened! The chart at the top of this post is from 2008. Data for the 2009-2010 academic year shows that the gap has widened even further. Hernan: You are so right. The idea of "free" public education is a fixture of the past. I posit that even if people pay for those programs that are important to their school and their community, it will still be far less than the cost of private school. And teacher's in public school generally have better training and kids learn how to function in a fully diverse society - across income levels, backgrounds, and in their own communities where they can build long lasting relationships. So, how do we change the mindset? Public education isn't free and it shouldn't be consider lessor, either. Without it we can't maintain the democracy so envisioned by our founding fathers.